Greek Aid Comes by Horse and All the News That Isn’t | Whad'ya Know? « Jim Packard’s Whad’ya Know? Escaped prisoners turn up on The View. Hundreds of outraged NPR listeners return tote bags after Kim Kardashian appears on Wait Wait Don’t Tell Me. Problem Greece has always had with the EU is ‘euro’ and ‘gyros’ sound identical. The final solution for Greece: Windex. Methane found on Mars. Wasn’t me. If Trump can’t stand up to Neil Young how’s he going to fare with Putin? Putin, btw, is known as the Donald Trump of Russia. Here’s a fun fact: if you want to pile up steps on your Fitbit use it as a collar on your cat. And swing that sucker by the tail. Jeb Bush’s Spanish better than his English; he runs in Ciudad Juarez, he wins! El gana! Tiger Woods explains his dysfunctional game as ‘coming from a bad urge inside of me’ he calls Brian Williams. Brian Williams says he’s African-American and his banishment from Nightly News is a hate crime. Ancient remains known as the Kennewick Man turn out not to be Bernie Sanders as long thought. Best thing going for Bernie Sanders is his given name is actually Bernie. Climate change? Is the Pope Catholic? You try air conditioning the Vatican–in Rome–in August! Republicans predictably say there is no climate change and the Pope is not Catholic. Obama trade deal falls through when we can’t get anybody for him. Not even a player to be named later. Why is it your family never says you’re white when you want them to? Don’t want to get into this thing with the woman in Spokane, however, if she wants to call herself Jewish, she’s welcome to. Because that’s a start. In a related story, the Census Bureau says on the next forms race, gender and % of Pacific Islander will be on a sliding scale. Astros hacked by Cardinals and most of the National League. Meanwhile, nobody has hacked the Brewers. Wait–here’s an update–nobody has hacked the Brewers. FDA bans trans fats, but not the fats you eat without even thinking about them, trance fats. 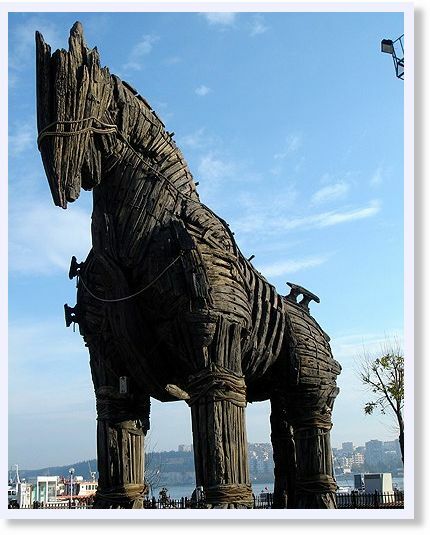 EU aid for Greece arrives in giant horse. I’m off to Delaware to score some Dover Wowie and a nice little corporation. Packers have a new play caller this season: Aaron Rodgers’ girlfriend. This entry was posted on June 22, 2015 at 9:31 am and is filed under Uncategorized. You can subscribe via RSS 2.0 feed to this post's comments.